As the B-29s raids continued over Japan, the government evacuated people from the cities to the countryside. 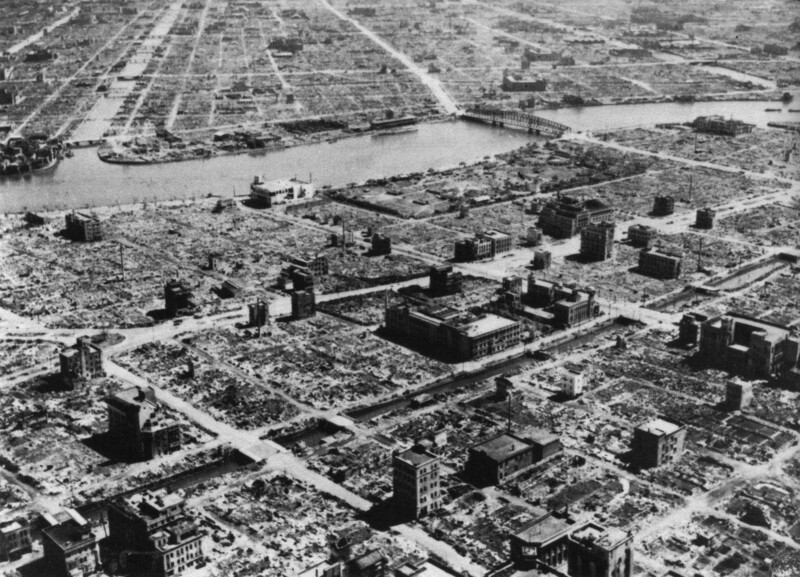 Cluster bombs, filled with napalm, left Tokyo in ruins. A photograph - documenting the bomb run of May 26, 1945 - provides an example. General Le May's objective was to stuff a B-29's bomb bay with as many M-69 bombs as possible. Each bomb contained "38 bomblets. They were filled with napalm and whatever they hit, they ignited ...The shell would turn into real sharp fragments that were very damaging." The air battle over Japan - before Hiroshima and Nagasaki - was intense and extremely damaging. People who were hit by the incendiary bombs were burned beyond recognition. Clip online, courtesy National Geographic. Bos, Carole "Bombing Japan - Incendiary Bombs Over Tokyo, Part 3" AwesomeStories.com. Oct 07, 2013. Apr 20, 2019.